Sometimes I forget, but I live in quite an awesome city. Amsterdam. And whenever I forget, the city itself hands me a kind reminder, telling me “Hey you, look! It’s pretty lovely around here”. a. Walk home, dump stuff, return later. b. Buy the flowers immediately, embracing your inner pack-donkey. I wouldn’t be me if I didn’t go with option b. The florist came to help me and the moment of payment arrived. Card at hand. He… only accepted cash. Solutions are there for those who need them, the ATM was two doors down. I started to clumsily fiddle with my bike and the several bags hanging from it. But “no, no, no, leave your bike and bags! Come on, in you go with that bike!” the florist said. Yes. He was bloody serious. I found myself riding my bike into the flower shop. Bags and parcels included. The florist would make sure it wouldn’t get stolen. 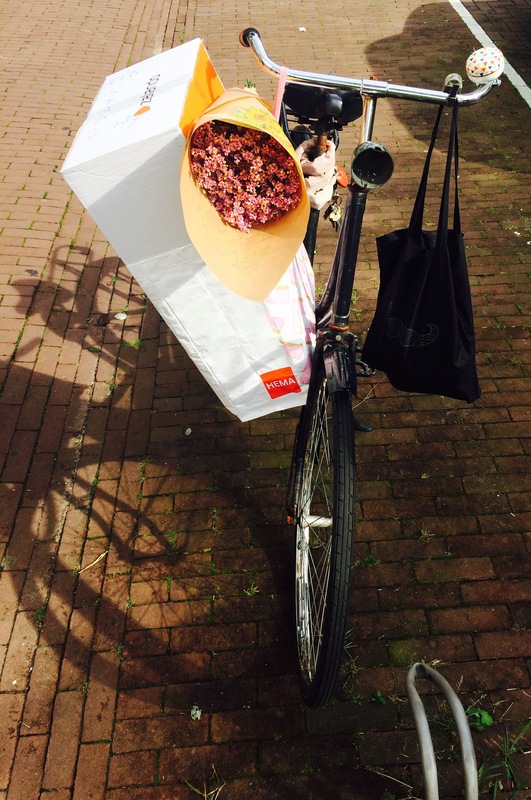 He kept his word, I paid for my flowers, carefully rode the bike outside again, walked home and thought to myself “only in Amsterdam…what a wonderful city”. Flowers look so good on my bike. Sometimes you can get possessed by a weird and sudden urge, without being able to explain why. A while ago my friend and I were selling our stuff at a little local Fleemarket. The evening before – I had packed everything for the next day and was ready to go to bed – I decided, very last minute, to go through ALL my buttons and sort them by shape and colour. ALL meaning my giant collection of two tins filled to the rim. There I was, sorting. Almost meditative. I found so many pretty buttons I had forgotten about, thinking of items they could brighten up. And I found so many light blue buttons, too. Light blue is not really my colour (she writes, while dressed in a white dress with light blue polka dots… sometimes exceptions are to be made). I started bundling them, the light blue buttons, sort by sort. No use for me, but ready to be sold at the market I decided. He told me this: back in the olden days an alcoholic would get a blue button for every year they were sober. He was a recovering alcoholic. Therefor he was covering an old jacket with blue buttons all over, as a trophy and reminder for being sober, year after year. And he touched my heart telling me this in all honesty. Sometimes you can get possessed by a weird and sudden urge, without being able to explain why. I can explain now, why I had to sort and bundle my button-collection that evening. Not only was yesterday International Peace Day. It was World Gratitude Day, too! So my heart for today is inspired by gratitude. I’m grateful for my very loving and golden friendships; I’m grateful for my amazing and loving parents and brother; I’m grateful for the sweet and thoughtful responses on my hearts; I’m grateful for my creativity that’s boosting; I’m grateful for the fact I live in a country where there’s no war; I’m grateful for you, reading this blog! And now onto the heart of today. I drew one heart, created two others out of it and then failed to choose one. So you’ll get 3 hearts from me. An amazing 3-for-1 deal! Enjoy! #43 – the drawing mixed with a confettied “thank you” I once made. Here’s a major catch-up, part one; hearts 24 – 32. And I realise I’ll still be behind, as today should be day #36 of my challenge. Do I have a good excuses for this delay? Well, yes. I got food poisoning… When I was finally back on track I did pick up continuing making hearts, but simply didn’t get round to posting them. Life is what happened :-) But once I’ve caught up, I’ll be determined to pick up where I was, as creating a heart a day is the best challenge! The focus I now have on self-compassion and compassion towards others is what I was looking for. It triggers my brain every day! So here we go, 9 hearts as catch-up part one. Descriptions underneath each photo. #25 – note to self. Pictures of the sketch and final drawing combined. #26 – note to self. Pictures of the sketch and final drawing combined. #27 – note to self. Pictures of the sketch and final drawing combined. #28 – you have to look closely to find the banana-candy heart. Inspired by the colours of the picture underneath which I took while baby-sitting. #31 – accidental as I wasn’t planning on creating a heart while clearing out my house… But then I found these, which I once made. In a very Dutch-flag mood. #32 – look away if you have a toe phobia! This is the real deal when it comes to ‘accidental’. Painting my nails, my eyes suddenly noticed this tiny read heart! Two hearts connecting. I’m trying to connect from the heart. With everyone. And foremost with myself. Listening to my own heart, doing what feels right for me. And not ignoring that. It’s a challenge – I learn to accept that some days are off-days, also when it comes to heart-connection – but a good one. It’s also totally in tune with my self-compassion journey and my heart-a-day challenge!